We are so proud to introduce to our readers the talented and funny Ruth Leon Weiman. 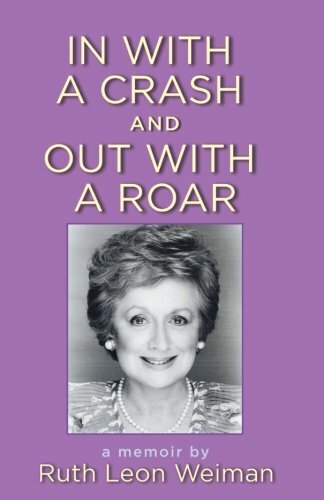 Ruth is the author of the newly released In With A Crash And Out With A Roar: A Memoir available on Amazon. The book is funny, sentimental, educational, a great read and we will be excerpting it soon. She, to me, is a Philadelphia legend and knows how to tell a story! We will be excerpting this book, but for today, we are posting her print interview on HO. Book Description: Having written this memoir, I was able to reflect on my life—the little girl having such joy while seeing the puppet show in school who grew into a person who deeply appreciated everything about life that celebrates emotions, whether occasioned by joys or sorrows. Not as an observer, but as a participant, excited about life itself—a life that I created, my own experiences, for better or worse. I think one of the key themes of my book is perseverance and survival against all odds. Parental disapproval of your choice of career requires unending perseverance on your part. I didn’t let that stop me. I was lucky to have a supportive husband who believed in me and was willing to participate, while courting a demanding career of his own, in the rearing and attention paid to our 5 children when I was performing “overtime.” Part of being in a repertory theater requires venturing into unknown territory, another theme. We traveled outside of Philadelphia, because we went to schools in all districts, in addition to traveling to Washington, Boston, Pittsburgh, etc. We also performed in mental institutions because our plays were followed by a professional discussion leader, and it was thought it would stimulate reality in some patients. Ethel Barrymore Colt, Kathryn Cornell, Cornelia Otis Skinner were some of the actresses who founded our theater. They were the leading actresses of the stage at that time. I was born in Philadelphia to Max and Minnie Leon. My mother came to Philadelphia from Lafayette, Indiana, and my dad arrived here from Poland when he was 17 years old carrying his violin, 40 cents in his pocket and as he put it, “A Bag Full of Hope.” My mother had an undergrad degree from Temple University and a Masters from St. Joseph’s University. My dad became the founder and Conductor of the original Philadelphia Pops Orchestra. He was a noted philanthropist as Owner of WDAS Radio Stations. My husband was an attorney and I got my BA in Radio Speech and Theater from Temple and studied at Littlefield School of ballet and joined the Company as well. I also studied Ballet Arts in Carnegie Hall in New York and attended classes in Paris with the famous Olga Preobrajenskaya. I also was an actor with Plays for Living of Philadelphia–a National Repertory Theater and as a freelance actor who appeared on several soap operas, many films, several commercials and modeled for pharmaceutical companies on QVC. I also studied piano with concert pianists Theodore Letvin, Anna Burstein Beiber and Josef Wissow. 2. What inspired you to write this memoir? I have had such an interesting life with so many exceptional people who added immeasurably to it that I wanted to share these experiences. At first, it was just for my family and then I shared with other people who seemed to enjoy the many stories. 3. This book has so many interesting life turns and lessons. What life events influenced you the most (good or bad) and how did you use your humor which is prevalent in the book to get through the good times and the bad? There is no life without some hits and some misses, but if you have a send of the ridiculous and/or the absurd, it helps to soften the blows that might come your way. A tragedy which nothing can assuage is another story. 4. You are such an experienced actor. How did you get into the field and what did you enjoy the most about this profession? First of all, there is no substitute for learning your craft. Occasionally there is someone who physically “looks the part” and with some coaching can manage to get through a scene in film, never on stage, but that is rare. One of the elements of training in stagecraft is discipline and the technique of transmitting your character/message to the audience without them realizing anything other than sincerity. It was a natural thing to go from 4 years of university to auditioning for parts in plays and I was fortunate in that I almost always got cast. 5. What do you hope your readers take from these pages? I would hope that the readers of my book will have enough faith in themselves and enough of a conviction of their desire to work at what they love, to stick with it through disappointment or lack of family encouragement to keep going. KEEP GOING! Keep trying, keep moving forward! 6. What is your favorite part of your book? and what was your least favorite to write about? I really have no favorite part of the book. It was all so wonderful to recall. A joyful task. There was no “least favorite” part either because if something didn’t strike me well, I opted not to include it. I don’t want to relive or cause someone else to relive an unpleasant experience.